Convert document from one format to other format. Liferay have inbuilt support to convert various document from one format to other formats with the help of Open Office service. Once portlet is deployed successfully you can see the portlet in sample category name as Doc Converter. Please read full article before test this portlet. Here also some limitations means some of the conversion may not possible any how mostly we can convert documents form one format to other format very easy. Internally liferay using JOD converter to do this conversion process.JOD converter is java library have set of classes form which we can convert documents. Liferay already implemented their own java classes with the help of JOD converter library so that we can use life ray classes to do this process. Liferay provides one of the class called DocumentConversionUtil by using this we can convert documents from one format to other format. The following are the sequence of steps we need to do. Once you downloaded open office then install in your machine and follow the installation steps based on Operating System you have. One installation successfully done then we have to start open office service from command prompt. 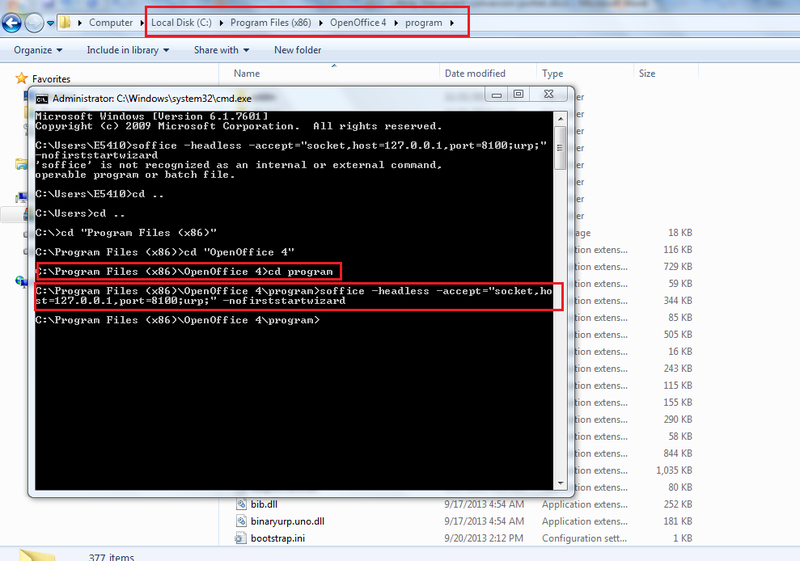 In windows open command prompt and go to installation location of open office and then go to directory called program. sudo soffice "-accept=socket,host=localhost,port=8100;urp;StarOffice.ServiceManager" -nologo -headless –nofirststartwizard"
The following is screen shot to run open office service in Windows. Login as admin and go control panel from that go to server administration which is in left side server section. If you change the port number at time of open office installation, then you need to change in liferay configuration too. Once we did all above then we can start convert documents. Liferay have in build support to convert document from one format other with help of Open office service. To enable open office service in liferay we have to install open office and start open office service then we need to configure in liferay. Once we configure this we can also download journal content with different formats and also in document media portlet you can see different conversion features.